Blueberry sauce is a great way to use fresh blueberries when their peak season brings a bounty of berries. Better yet, there are many ways to use this fruit sauce, from an ice cream topping, a sauce for bread pudding, or to serve with waffles. 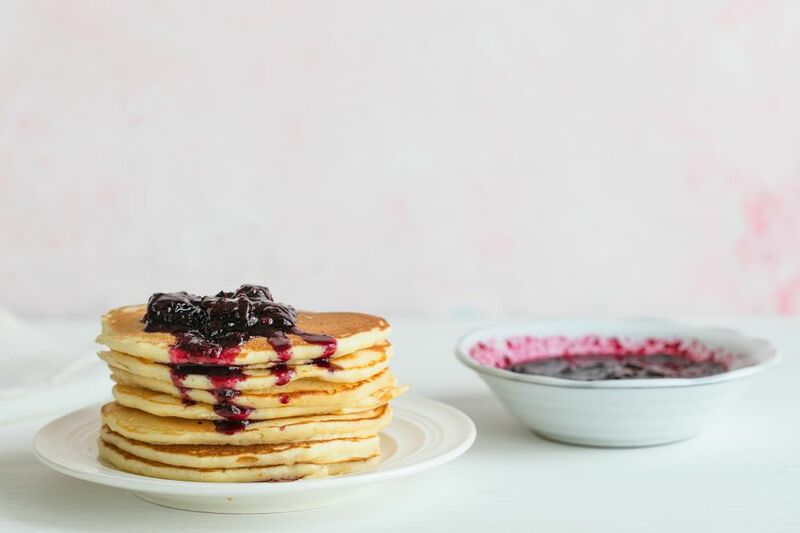 Scale up the recipe and store in the freezer; you will have blueberry sauce on hand year-round to bring a taste of summer to your dishes any time! Though fresh blueberries are best, you can also make this sauce with frozen blueberries. This easy sauce is a simple combination of blueberries, sugar, and a little fresh lemon juice—and it's all made without cornstarch. It can be combined with lemon curd and spooned onto sponge cake and a little blueberry sauce stirred into cream cheese makes an amazing spread for muffins, biscuits, and quick bread. Wash the blueberries in a colander. Sort through them and pick out pieces of stem. Transfer the blueberries to a saucepan and use a potato masher to crush them. Add the sugar, lemon juice, and salt. Mix well. Place the pan over medium heat and bring the blueberry mixture to a boil. Boil for about 1 minute. Add the vanilla extract and stir to blend. Transfer the sauce to a bowl or container and let it cool to room temperature. Cover and refrigerate. When ready to serve, warm the sauce slightly to spoon over bread puddings, pancakes, cake, or ice cream. When buying fresh blueberries, which are at their peak from May to October, look for firm, uniformly-sized, dark-colored berries; turn over the container to make sure there aren't any mushy ones on the bottom. Fresh blueberries will remain good for about 5 days when stored in the refrigerator. For longer storage, you can freeze. Place berries in one layer on a baking sheet and put in the freezer until frozen. Then pour into zip-lock bags and return to the freezer until ready to use; the berries will last about 1 year. To thicken the sauce more, simmer it over low heat for about 5 to 8 minutes after it has come to a boil. Replace the vanilla extract with 1/4 teaspoon of almond extract or with 2 teaspoons of grated orange zest. You can also swap orange juice instead of lemon juice if you like. Any leftover blueberry sauce can be stored in small, air-tight containers and placed in the freezer. Defrost and warm gently before using.